If reviews for e-cigs are anything to go by, there is a pricing war taking place in the industry. At least, some electronic cigarette companies have started one. It seems some good electronic devices are selling more cheaply than the competition, yet their performance is comparable. How will other companies compete? They will have to drop their prices or sweeten their deals. Just paste it into the cart at checkout for a 10% discount! 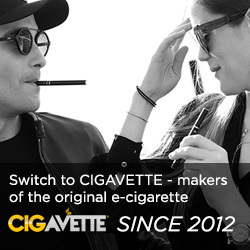 One firm that already manages to undersell the competition is Cigavette. Their products are designed to be simple and low-priced. The catalogue is not extensive making it easy to use. One way to try out their products is to get one of their disposable e-cigs (pictured here). Cigavette’s main goal is to help smokers transition to electronic cigs by producing a device similar to a regular smoke. Their sticks closely resemble cigarettes. If you like tobacco or menthol, their e-cigs are the right choice. Switch to an e-hookah and sample Cigavette’s sweet flavors in the same format as their ordinary e-cigs. Cigavette cartridges are also compatible with other brands, as long as the other brand of cartridge is threaded the same way. Cigavette provides 0 nicotine and increments of 6 leading to 24mg. Juice comes from China, so patriotic smokers might reject it or buy other cartridges. Each starter kit carries a different flavor or strength of nicotine, but the essentials remain the same. Your kit arrives in a cigarette packet-style package. It contains a USB charger, a 4.2-volt battery, and 2 cartridges. Select your preferred color of battery and LED light. Your price is $24.95. Overall, this is a reasonable price when comparing the Cigavette starter kit with other similar products on the market. There are two types of cig sets which amount to the same things as lavish starter kits. These contain a wall charger, more cartridges, a case, and a second battery. Again, a Cigavette review shows prices are similar to those found elsewhere on the internet. You could be missing the car adaptor and power cig, but those are available from other firms. Since cartridges can be swapped around, mix and match cartridges and hardware judiciously. Cigavette carries a portable charger, handy for traveling smokers. Cigavette also stocks a line of e-hookahs and they even have a Cuban e-cigar. The ultimate price you pay cannot just be calculated according to product pricing. A final figure includes shipping and the longevity of a product. Cigavette sends goods without charging shipping if orders reach $50 or more. Compare this to the $100 limit from many firms. Also, their cartridges will give users the equivalent of 125 cigarettes each. Imagine how long it would take you to smoke that many cigs and how much it would have cost you to buy them. Right away, you can see how economical electronic cigs from CV would be.